Remember NeoNurture? A quick recap, the “Car Parts Incubator” created for the people who coudn’t afford the traditional one. Developed by a group of team of awesome people named Design That Matters, they inspired an interesting thought and led by example by building an incubator from automobile spare parts which are abundant in the developing countries. They inspired several students from Stanford University who took up the job to build something that’s better. The EXTREME (design for extreme affordability) folks built an incubator that’s cheaper, portable and can be used in clinical setting as well as in a community setting. 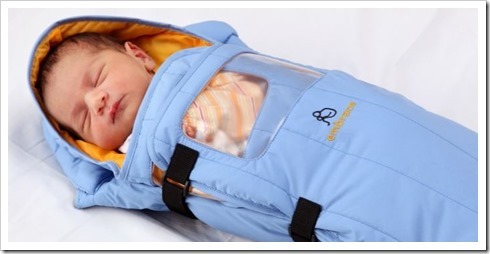 The product is aptly named as Embrace Infant Warmer, an innovative, low cost infant warmer for vulnerable new born babies in developing countries. It puts in use a phase change material to supply the heat to the bag which slowly releases the warmth to the baby over a span of 6 hours. The heating element (the phase change material) needs no electricity and can be heated after every four hours for just a few minutes in hot water. Another interesting feature is that the sleeping bag can be sanitized in boiling water and hence reusable. The significance of the product can only be understood if we understand the crisis. Around the world more than 20 million preterm babies are born with low weight. The more shocking info is that among those almost 4 million dies within the first month of their birth. Although most of those births happen in Africa and South Asia, US ranks sixth. India leads the list followed by China, Nigeria, Pakistan and Indonesia. The team started their journey from a Stanford University programme of affordable design engineering. The company was formed in 2008. The team experienced that most Nepalese preterm births happened in the rural places, and didn’t even make it to the hospital. This gave them an idea that they needed to build something that suited the rural setup, something that is portable, runs without electricity and most importantly affordable. The Embrace Infant Warmer fits all those categories. The non-profit founded by Linus Liang, Jane Chen, Rahul Panicker, Razmig Hovaghimian and Naganand Murty currently is a 35 employee strong company. They are primarily based in Bangalore, India. Embrace, as founded initially, branched out to Embrace Innovations which builds the product and markets them across the globe, thereby providing financial momentum for the non-profit wing which is also popular for their KMC (Kangaroo Mother Care) campaign that teaches mothers how to warm the kid with her own body. The investors for the Embrace Innovations are Vinod Khosla’s Impact Fund, known for it’s interest in innovative green tech and Jeff Skoll’s Capricorn Investment Fund. The project has so far impacted thousands of lives across the world and is working with government as well as NGOs to provide excellent healthcare at an affordable cost across the globe.